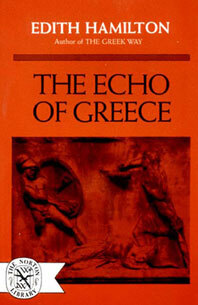 The Echo of Greece - Description | W. W. Norton & Company Ltd.
Fourth-century Athens has a special claim on our attention, apart from the great men it produced, for it is the prelude to the end of Greece. The kind of events that took place in the great free government of the ancient world may, by reason of unchanging human nature, be repeated in the modern world. The course that Athens followed can be to us not only a record of distant and forgotten events, but a blueprint of what may happen again. Essays on philosophy and literature, both ancient and modern, by the author of The Greek Way. Edith Hamilton buoyantly captures the spirit and achievements of the Greek civilization for our modern world. The noted author and scholar presents a guide to the prophets of the Old Testament for the modern reader.